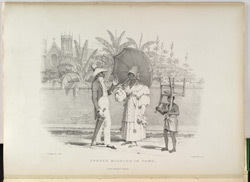 Plate from Richard Bridgens' 'West India Scenery,' depicting an enslaved man and woman in their 'Sunday best.' Bridgens comments on the 'strange' appearance of the woman, assuming that she has not fully understood the fashion of the British colonists. He notes her lack of stockings and inappropriate shoes, but she may have deliberately refashioned the European style to suit her own taste ? or she may not have been able to afford all the 'correct' accessories.